Greetings my loyal friends and followers. It’s here! The day you have all been looking forward to for simply ages, is HERE! 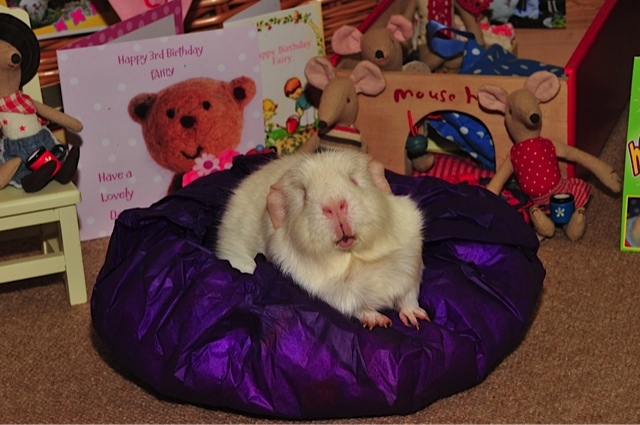 I am THREE today! Yippee and everything. Yes, I am all big and grown up now. 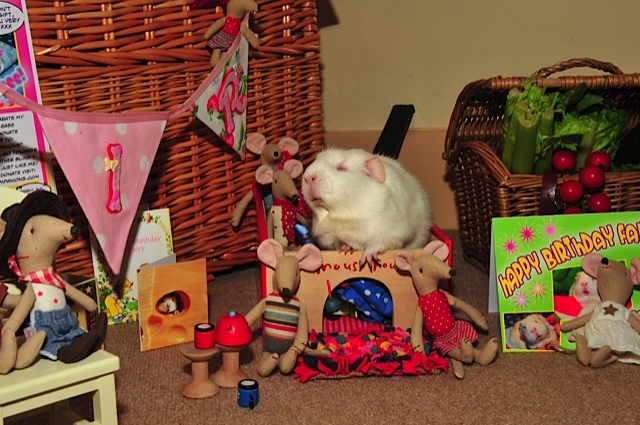 I can’t believe my eyes, a jolly big party has been laid on for little ol’ me, and there’s bunting and, Mousies and, and everything . . . can’t spot the snackettes yet, but I am sure they will be some tasty morsels somewhere. I’d better go mingle, meet some guests and what have you. Hello, Mr Bear, fancy seeing you here. Is that your first glass of sherry today? Oh, it’s your third is it? Better make it your last, we don’t want any ‘unpleasantness’ now do we? 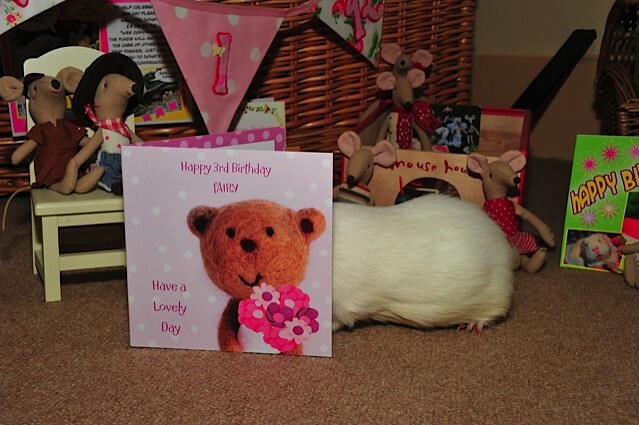 Time to check out my Birthday Cards . 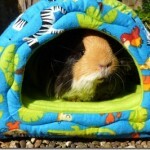 . . this one is from Mummy and Daddy and Marigold, and it’s a perfect fit! And this one . . . it has a lot of very flattering words inside . . . can’t quite make them out, but . . .
. . . it is definitely for me. Look, it’s got my name all over the front. Nice bear pic too. A very nice SOBER bear! Are we having party games? 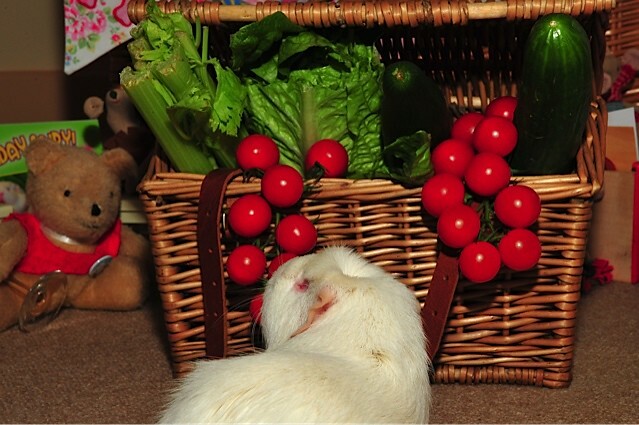 Hunt the Lettuce? No? Not much of a party, is it? Oh . . . there’s a PRESENT? 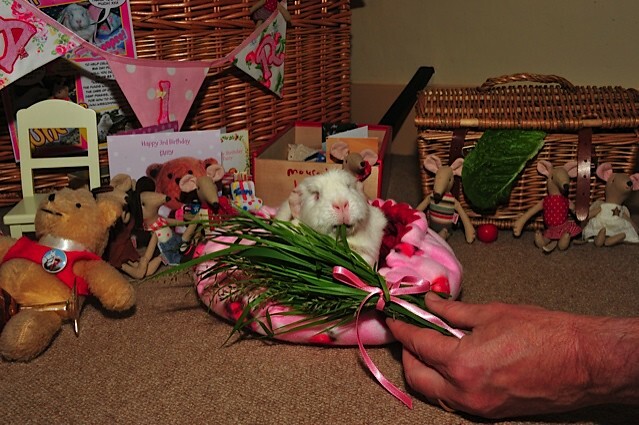 For ME? 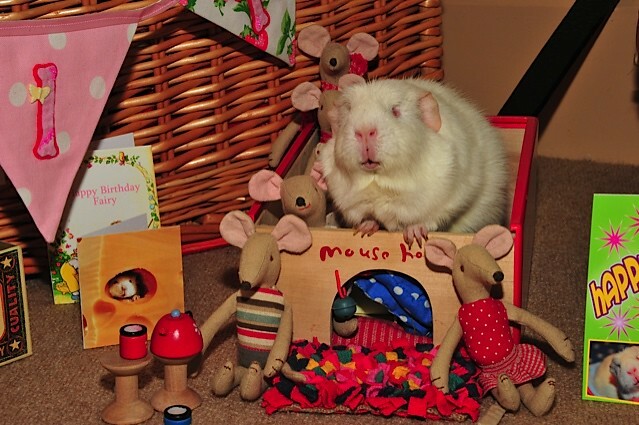 Thank you Mousies, this is such a WONDERFUL party! I LOVE IT! All purple and a jolly nice place to sit and have a well deserved rest. I am not usually one to complain, but it is actually a bit hard and crispy crunchy. Oh! I see. My real present was hiding inside that integral, disposable seat cover arrangement. 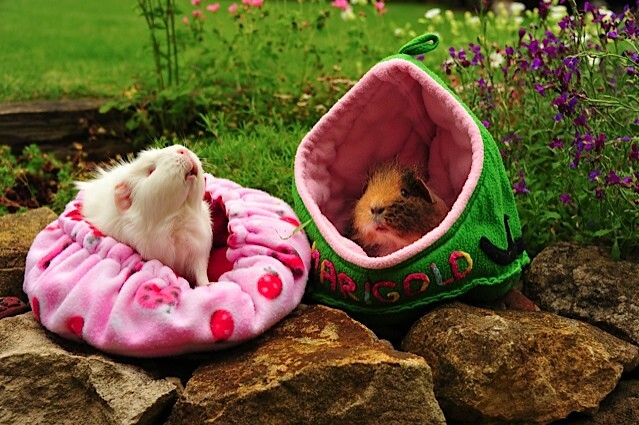 It’s a jolly nice bed fitted with ladybirds and the best bit is it is pink with more pink all over. 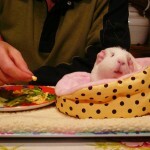 Was that the dinner gong? 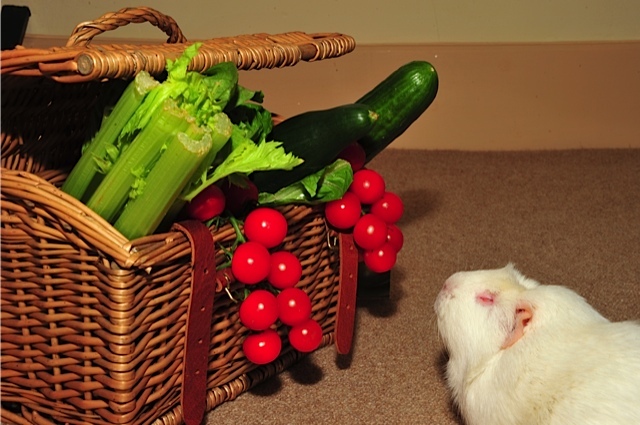 Hooray, this looks more like it, an itty-bitty salad hamper, if I am not mistaken! 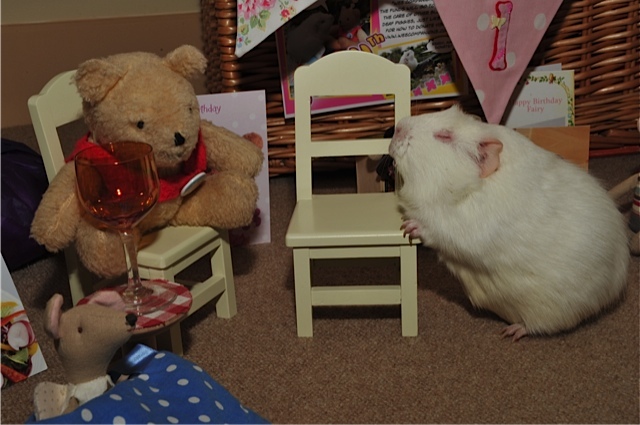 Oh Mr Bear, that glass looks suspiciously on the empty side. 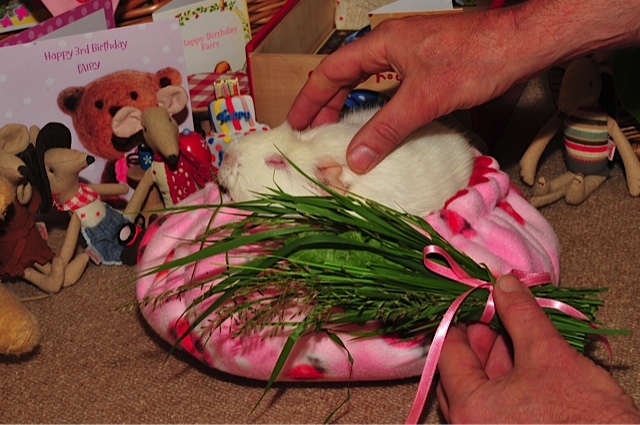 And a super bouquet of grass for . . . nom . . . . me? Nom, it is very nom nom nom nice, thank you, daddy – very tasteful. 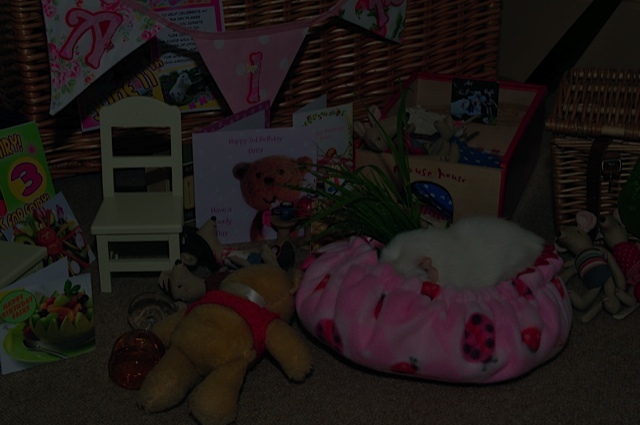 Can someone come and cart Mr Bear off to bed please? He has ‘overindulged’ again. Too late – he had better stay here and sleep it off. 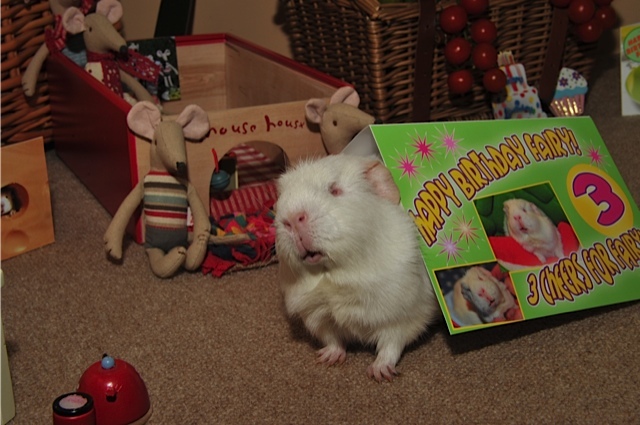 It is traditional to have special Birthday Scritchy-Scratches. I’ll have the full three minutes worth please, seeing as I am three today. 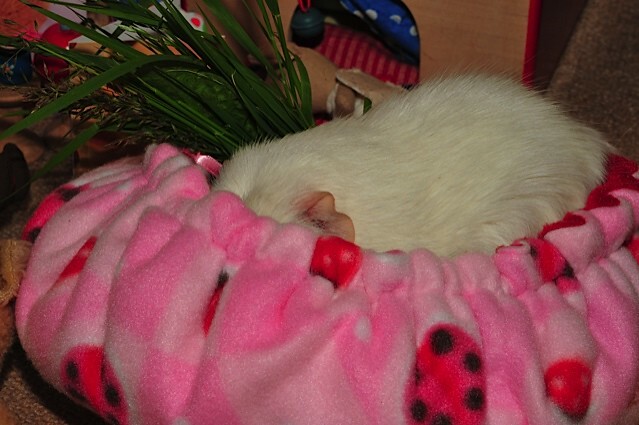 All this hectic partying has made me rather sleepy . . . I’ll just double check this new bed for . . .
6 hours later . . . .
Marigold, guess what? Seeing as how you overslept and missed my big Birthday Bash, we will have another one – EVERY day of the year! Oh Fairy, you are such a superstar. I can hardly believe it’s been three years since you were a tiny babe in Pasquale’s paws. 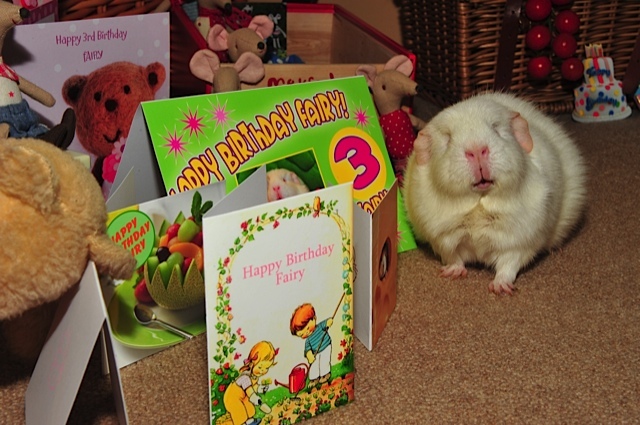 A very, very happy 3rd birthday to you dear Fairy and many happy returns too. ha-ha-ha-happy birthday sweet fairy-lein ! 3 years … and what a magical life. 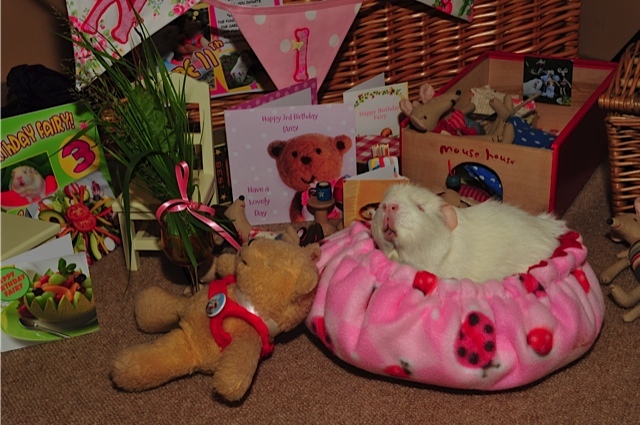 and what a lovely birthday-day-presents-cards-bear-mouses-mum and dad-story !!! ingrid and 8 meeris and all the others here. 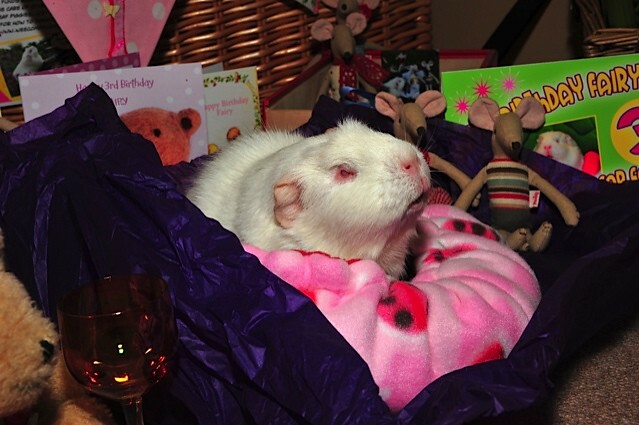 A lovely birthday party for a lovely guinea pig! 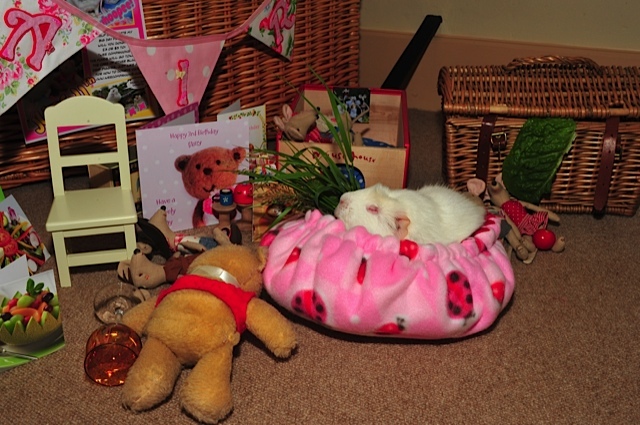 You do look adorable in your new bed – are you really sure you’re all grown up now though?! 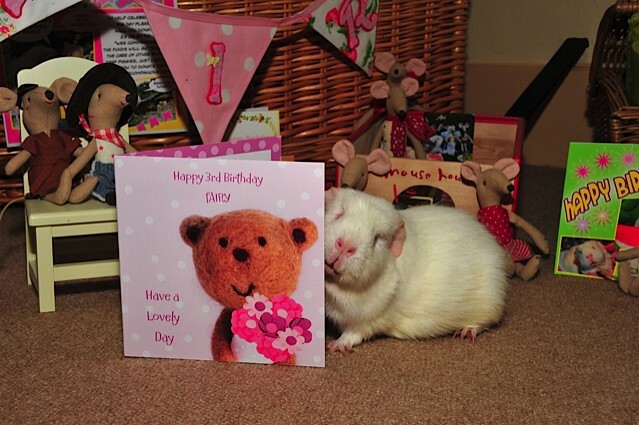 Fairy would just like to say to all her friends from all around the world – Thank you for your lovely comments and Birthday wishes. 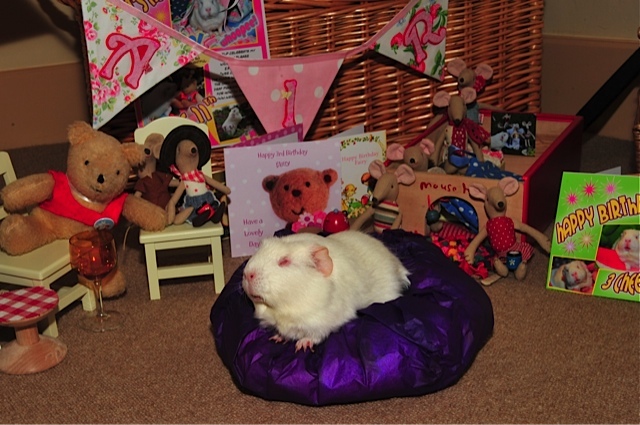 And yes Katherine, I AM all grown-up, cos Daddy says I am a propper little madam. So there!